A foul-mouthed drunk launched into a bizarre tirade when asked to leave a pub by bar staff, swearing he was Scottish and from Easterhouse. Stephen McGregor (43) let rip at employees of The Auld Vic in Falkirk and threatened them with violence after being asked to leave the premises on several occasions. Falkirk Sheriff Court heard last Thursday his rage rumbled on once he eventually left the Grahams Road bar, continuing at the nearby Tesco petrol station where police were called to arrest McGregor. 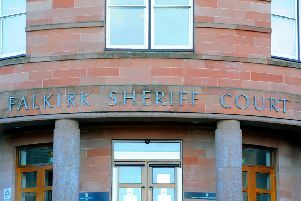 The attending officers then had to bear the brunt of his abuse as he was taken to Falkirk Police Station. Appearing in court, McGregor, 1457 Shettleston Road, Shettleston, had admitted acting in a threatening and aggressive manner by shouting, swearing and uttering threatening, abusive and racial remarks on Sunday, September 2. The court heard McGregor had been involved in an altercation earlier that day, during which he claims he was assaulted, with a group of fans travelling to a football match. Procurator fiscal depute Graham McLachlan said: “The accused was seen by bar staff misbehaving. They approached him and asked him to leave the premises a couple of times and he refused. “He walked off and ended up at a filling station. A person filling up their car had their attention drawn to the accused when he began singing. McGregor, who the court heard has 17 religious or racial breaches to his name, was traced by police and arrested shortly after. His defence solicitor said his client accepts he has a drink problem but hadn’t drank for a year prior to the incident. Sparing him jail due to his early guilty plea, Sheriff Livingston ordered McGregor to complete 240 hours of unpaid work within six months.